The Kitchenaid KFPM770 Food Processor will make quick work of all your food prep chores when you cook. It slices, dices, blends, chops, and purees with ease. Its powerful 700 watt motor can tackle just about anything. The ultra-wide food chute can handle cucumbers, potatoes, tomatoes and more with minimal slicing involved on your part. The bowl holds a generous 12 cups and includes three clear polycarbonate work bowls. The hard work is handled by the three stainless steel discs which are made with precision to ensure fine slicing and grating every time. A storage case will keep your food processor safe and clean when not in use. All parts but the base can go in the dishwasher for easy cleaning. The brushed nickel finish looks professional on your countertop. The Kitchenaid KFPM770 Food Processor is much quieter than your average food processor. The brushed stainless steel looks great wherever you put it. The base and top lock easily into place; you don't need to struggle with it. The extra bowls are very convenient. It is simple to control what the processor does to your food, and the large food chute is large enough to take an entire potato. Purees are finished in seconds. You can grate a pound of cheese in seconds. This machine is very fast. Attachments may vary, but you can make dough, mix eggs, make salad dressing and more in this convenient machine. The Kitchenaid KFPM770 Food Processor is rather expensive. Overfilling the bowl with liquid can cause quite a mess. Instead of being able to process a lot of liquid, the amount you can work with is less than half the quantity advertised for capacity. Kneading dough seems to create a problem with the blade becoming stuck. Dough also ends up outside the bowl on the center stem, creating a cleaning problem. The electrical cord is really short, which may be an issue if you don't have a plug-in close to your work space. The food processor is heavy; this may be an issue if you suffer from arthritis or problems with your wrists. The Kitchenaid KFPM770 Food Processor is a heavy duty work horse in the kitchen. It can handle almost any task you put in front of it. The brushed stainless steel housing is attractive, though it contributes to the weight of the machine. The powerful motor holds up better than the on/off switch. 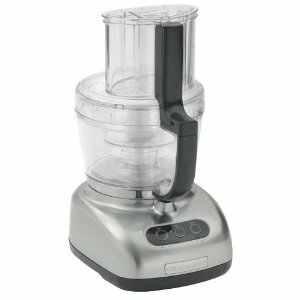 Occasional issues by users may cause one to pause before purchasing such an expensive machine, but if you really need a food processor, this model functions very well. Most user comments are extremely positive about the Kitchenaid. Like their other products, this one is build pretty solid and performs well overall. The extra wide feed chute is just another plus for this machine. Being able to put in whole or halved vegetables saves a lot of time compared to chopping your vegetables before you can even process them.